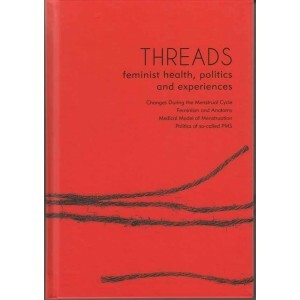 Threads, feminist health, politics & experiences. Threads combines quotes, excerpts, writings, personal stories and images to explore different experiences of the menstrual cycle and to take a critical look at how western medicine defines women’s bodies and experiences. predate reductionist western science. It also gives an outline of how awareness of the changes that can happen during the menstrual cycle can be used as a method of contraception. It expands on some of those changes and looks at both different experiences of and the politics of what gets called ‘PMS’. It looks at why western medicine defines a whole breadth of cyclical experiences women can have as illness. includes a mass of radical information about female anatomy and sexuality that’s comes directly from women’s own observations. A new Active printing of this publication.